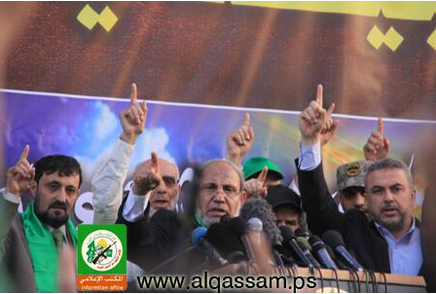 Last week the US State Department announced the designation of the former Hamas interior minister – and occasional BBC quotee – Fathi Hamad (also spelt Hammad). Readers may recall that when Israeli forces carried out strikes on communications antennae on buildings housing Hamas’ TV stations (including Al-Aqsa TV) during the conflict in 2012, the Foreign Press Association – which at the time was headed by the BBC’s Jerusalem bureau chief Paul Danahar – and the then BBC Gaza correspondent Jon Donnison promoted the false accusation that Israel was “targeting journalists”. On July 23rd 2014 a member of staff at the Guardian decided to use a certain photograph to illustrate that particular day’s letters page and, by way of a caption, added the following amended quote from one of the letters (ironically complaining about BBC impartiality) published on the same day. With the subject of that sentence being “Israel’s attacks”, one might have expected that the image chosen would have some sort of connection to that topic. However, the photograph selected actually shows a Palestinian father holding the body of his infant son who was killed in November 2012 by a rocket misfired by one of the Palestinian terrorist organisations in the Gaza Strip. 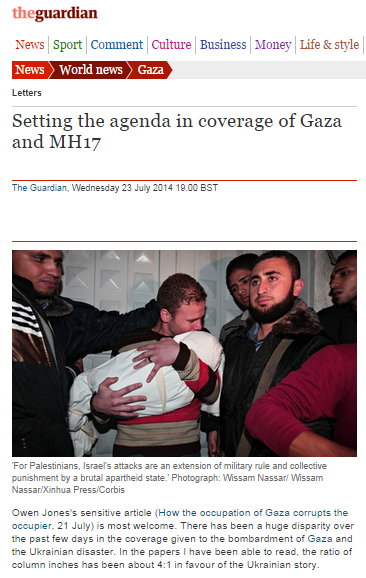 So why would that Guardian staffer believe that the picture showed the aftermath of “Israel’s attacks”? Well, like other members of the BBC’s audience, he or she was for months mistakenly led to believe by the BBC that Omar Masharawi was killed by an Israeli airstrike. “The BBC used the story of Omar Masharawi to advance the narrative of Israel as a ruthless killer of innocent children. It did so in unusually gory detail which etched the story in audiences’ minds, but without checking the facts, and with no regard whatsoever for its obligations to accuracy and impartiality. BBC reporters and editors – including Jon Donnison, Paul Danahar and the many others who distributed the story via Twitter – rushed to spread as far and wide as possible a story they could not validate, but which fit in with their own narrative. Clearly, twenty-one months on, what still remains in people’s memories is the BBC’s extensively promoted inaccurate story – not the subsequent belated correction. One particular BBC story has been making the headlines in various round-ups of Middle East media coverage throughout 2013. Although it was first publicized extensively in and around late 2012, the story relating to the unfortunate death of the son of BBC employee in Gaza Jihad Masharawi came into the spotlight once again in March 2013 when the BBC’s unproven and unsupported claim that the little boy had been killed in an Israeli operation had the rug pulled from under it by a UNHRC report. Of course the real issue behind this story – the fact that the BBC knowingly published and extensively promoted a story for which it had absolutely no proven evidence, purely because it fit in with the political narrative accepted and promoted by the BBC – has to this day not been adequately addressed by the corporation which claims commitment to editorial values of accuracy and impartiality. On Thursday November 14th staff from the BBC Jerusalem Bureau visited the Gaza Strip, where several Hamas-organised military parades marking the anniversary of last November’s fighting against Israel were taking place. 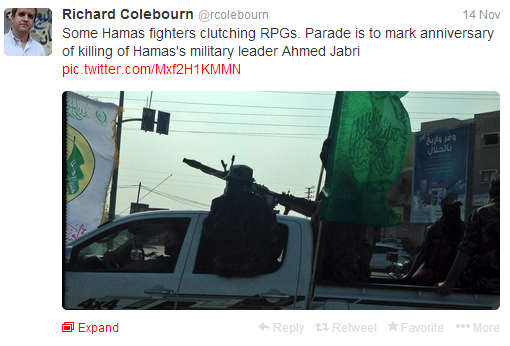 The parades included displays of weaponry and masked gunmen and were attended by Hamas leaders. 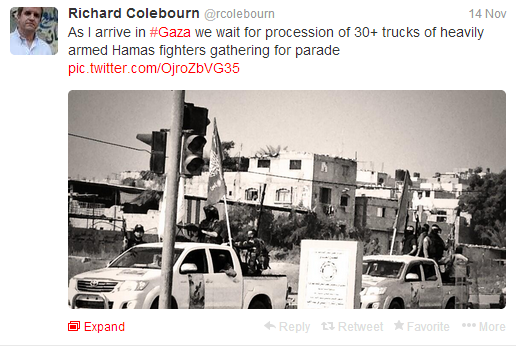 Despite the BBC presence on the ground at the time, no report on these parades has appeared on the BBC News website. 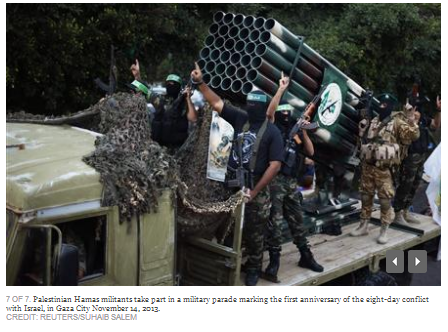 On the same day, two mortars were fired into Israel, for which the Palestinian Islamic Jihad (which also held its own parades) claimed responsibility. 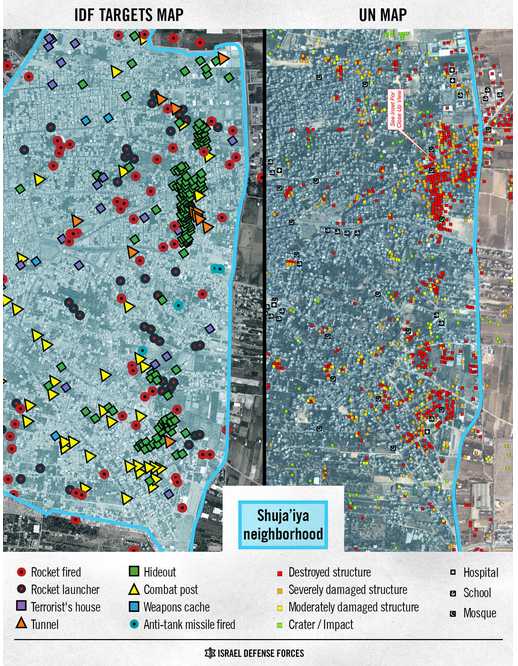 The IDF targeted rocket launching sites in the Gaza Strip in response. Although its journalists were clearly aware of the incident, no report on the subject was produced by the BBC. 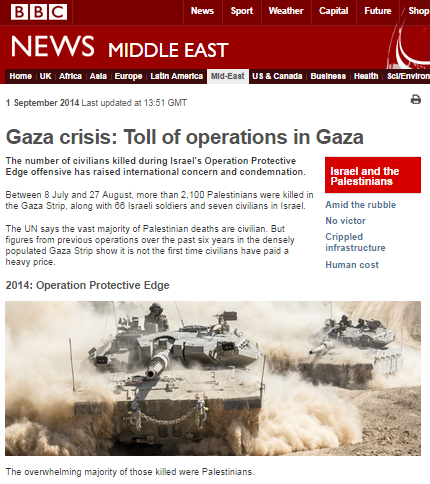 To date, no report on the ongoing fuel crisis in the Gaza Strip has appeared on the BBC News website. 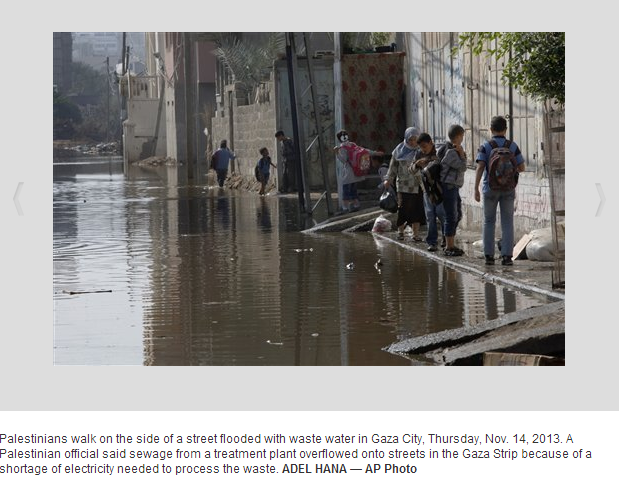 Hence, BBC audiences remain unaware of the dispute between the Palestinian Authority and Hamas which, among other things, has resulted in streets being flooded with sewage – although apparently it does not impact Hamas’ ability to hold parades of motor vehicles. “Though it may be hard to believe, 1.5 million Palestinians have lived without electricity throughout most of the day in 2013. For the past two weeks, residents of the Gaza Strip have endured a cycle of six hours of electricity followed by a 12-hour power outage. Last Wednesday, the power went out at 6:00 am and was finally restored only late that evening. This current crisis is not the result of a tighter “Israeli siege” or anything of the sort; it is caused by disputes between Hamas and the Palestinian Authority over the price of fuel since the tunnels connecting Gaza and Egypt were shut down or destroyed. Recent Egyptian military activity rendered out of commission hundreds of tunnels that once connected Sinai and Gaza and were used to import one million liters of fuel into Gaza each day. As a result, Hamas has no choice but to purchase fuel from Israel via the Palestinian Authority at prices similar to those found in the Israeli market, namely over seven shekels ($2) per liter of gasoline. That is a major problem for private car owners. The more acute problem is that fuel is needed to operate the Gaza power plant that generates the majority of the local electricity. The Palestinian Authority purchases a liter of fuel for the power plant for approximately 4 shekels from Israeli gas companies and has tried to sell it to Hamas for almost double, including excise tax. 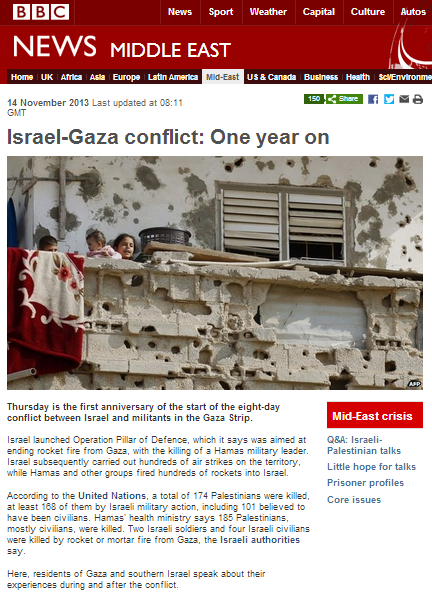 On November 14th 2013 the BBC News website’s Middle East page included an item in its ‘Features & Analysis’ section titled “Israel-Gaza conflict: One year on“. This version of events fails to provide BBC audiences with any of the important context to the beginning of the operation. 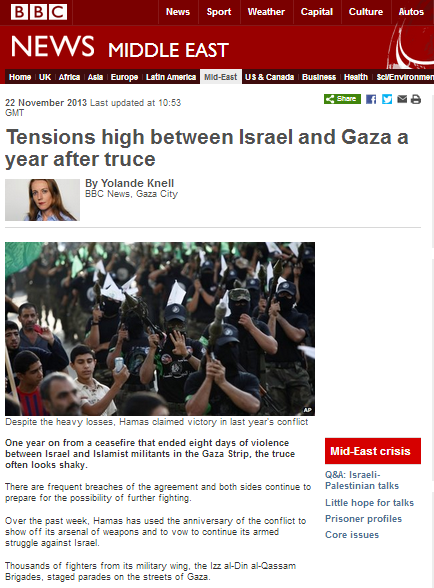 The use of the phrase “which it says was aimed at ending rocket fire from Gaza” implies that the BBC is not convinced that the fact that between January 1st and November 13th 2012 (the day before the operation began), 797 missiles had been fired from the Gaza Strip at civilian targets in Israel – one hundred and twenty-three of them between November 10th and 13th alone – was reason enough for Israel to take action to stop those terror attacks. The notion that the conflict began with the death of Ahmed Jabari is one which was heavily promoted by the BBC at the time, and it was enabled by the fact that the BBC’s reporting on terrorist attacks emanating from the Gaza Strip in the months prior to the operation was at best patchy and selective. No BBC reporter set foot on the ground in southern Israel until after the operation began, despite the proximity of its well-staffed Jerusalem Bureau to the region paralysed by six weeks of almost continual missile fire on civilian targets. Notably, the casualty figures cited above from Hamas and OHCHR sources suggest that fewer combatants – and hence, more civilians – were killed during the conflict than do figures from other sources. Clearly, the Hamas claim that the casualties were “mostly civilians” is not credible information and it is inappropriate for the BBC to promote it without independent verification. It is evident even from this short introduction that the BBC did not carry out effective post-event examination of its coverage of Operation Pillar of Cloud and hence the same inaccurate themes are still being promoted one year on. On the morning of Friday, October 25th a vehicle transporting pupils from Mevo Dotan in northern Samaria to school was attacked with an improvised explosive device. Fortunately, neither the driver nor the young passengers were injured. IDF forces searched the area for the perpetrators of the attack. On the evening of Saturday, October 26th a bus and a car travelling in the al Fawar area south of Hebron were attacked by stone-throwers. 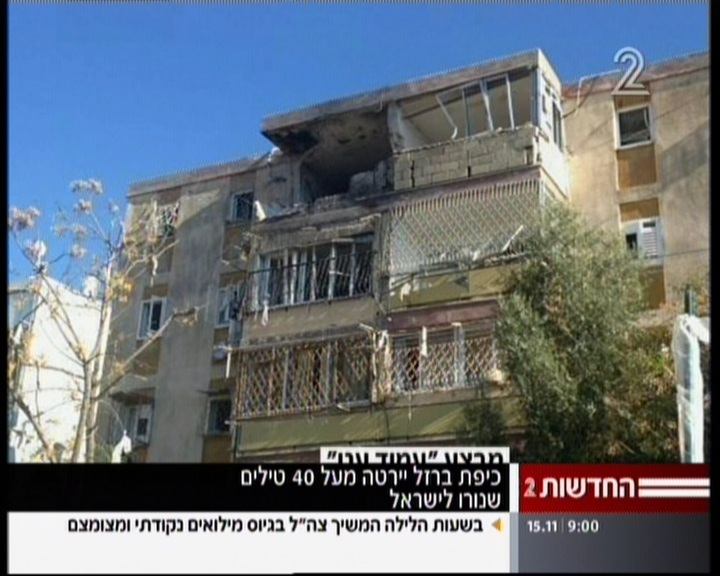 Eight Israelis and one Palestinian girl were injured in the attacks. In the early afternoon of October 27th two mortars fired from the Gaza Strip hit the Eshkol region of the western Negev, fortunately falling in open areas with no injuries caused. Like the vast majority of attacks against Israeli civilians, none of these examples of recent attacks was reported by the BBC, which tends only to relate to incidents in which there are fatalities or to Israeli actions resulting from those attacks. Terror, of course, is not just about specific incidents of damage, death and injury – its main purpose is the ‘drip drip’ intimidation of the broader civilian population with the knowledge that it could happen to them too – at any time and in any place – and the use of that fear to force political concessions from governments ultimately steered by public opinion. Whilst many informed observers currently do not seem to regard the recent upsurge in violence as heralding an imminent third intifada, the fact remains that by downplaying – or completely ignoring – the daily acts of violence directed at Israeli civilians, the BBC neglects to provide vital context which is crucial for audience understanding of the situation as a whole and specifically, Israeli counter-terrorism measures aimed at containing the violent incidents targeting civilians. But the failure to accurately report the overall picture does not only sell short the BBC’s obligation to provide audiences with a “global understanding of international issues“; it also affects the standard of BBC reporting and adherence to its own editorial guidelines on accuracy and impartiality. As we saw in the lead up to last year’s ‘Operation Pillar of Cloud’, the fact that the BBC had consistently ignored the majority of the preceding missile fire and other attacks (putting no reporter on the ground in towns and cities such as Ashkelon and Netivot until Israel responded to six weeks of paralysing missile attacks) meant that – with BBC audiences oblivious of the context – it was then able to erroneously claim that the violence began with Israel’s targeting of Ahmed Jabari and to make the bizarre assertion that the operation was part of the incumbent Israeli government’s election campaign. It is the same lack of presentation of the context of the ‘drip drip’ of ongoing intimidation by terror which creates an environment in which BBC presenters can embarrass themselves – and the organization they represent – by making crass statements about the numbers of Israeli casualties, as was the case with Mishal Husain last year. Clearly, an organisation as experienced in news reporting as the BBC can do better – both for its audiences and for its own reputation – if it so wishes.